Coal is an abundant fossil resource that consists mostly of carbon. Energy content (Btu/pound) ranges from 5,000 to 15,000 depending on the type of coal. Coal reserves are located all over the world. 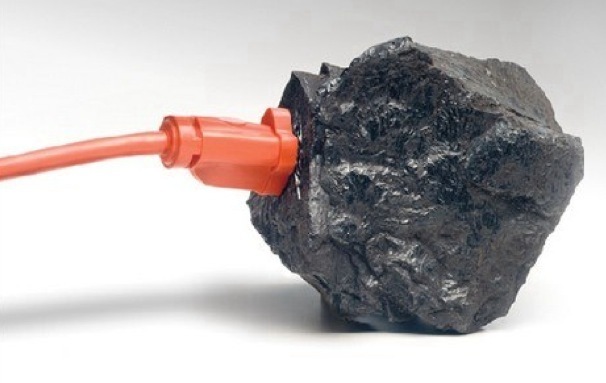 Electric utilities consume about 87 percent of the total coal produced. In the United States, coal is used to generate more than half of all the electricity produced. It is also used as a basic energy source in many industries, and as a heating fuel. The U.S. is one of the top exporters of coal in the world. Most exported U.S. coal goes to Western Europe, Canada, and Japan. Coal is recovered from the earth by surface mining or deep mining. Surface mining, or strip mining, is less expensive and usually occurs on flat land. 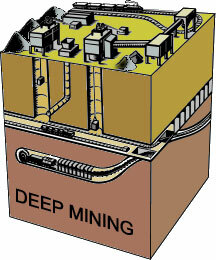 Deep mining requires digging shafts and tunnels to get to the coal seam. Automation of deep mining has helped to counter its safety and health hazards. Coal can be gasified to form a synthetic fuel similar to natural gas. It can also be liquefied to make a synthetic crude oil. To date, it has not been economical to make synthetic fuels from coal on a large scale. As processes become more efficient, the use of synthetic fuels may become more economical. Coal is a burnable carbonaceous rock that contains large amounts of carbon. Coal is also a fossil fuel—a substance that contains the remains of plants and animals and that can be burned to release energy. Coal contains elements such as hydrogen, oxygen, and nitrogen; has various amounts of minerals; and is itself considered to be a mineral of organic origin. Coal deposits come from many epochs, but the best and most abundant are from the forests in the warm, swampy river deltas of the Carboniferous period, some 320 million years ago. Long before the dinosaurs reigned, there was a time ruled by forests of giant ferns, reeds, and mosses. The earth was a warmer, steamier place back then and plants thrived, growing taller than our tallest trees today. As these plants died, they fell into the swampy waters to form rich layers of peat. These layers were typically sandwiched between layers of sediment like shale, deposited when waters temporarily retreated. During the Permian period, about 290 million years ago, the seas receded entirely, and many coastal plains turned to desert. Sedimentary rocks like sandstone were laid down over the shale and peat. Later, limestone was laid down when the waters returned. In time, the weight of the upper layers pressed down on the lower layers, causing tremendous pressure and heat. This triggered chemical changes in the peat, forcing out oxygen and hydrogen and leaving behind rich deposits of carbon, called coal. The deeper the coal, the more pressure was exerted on it. This caused different grades of coal—from hard, pure anthracite to softer lignite. 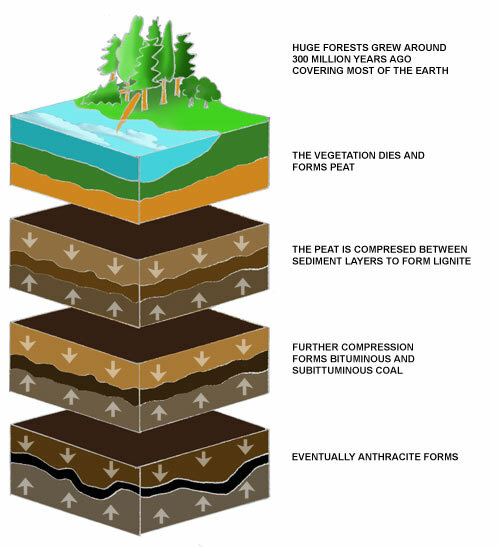 Between these layers lay bituminous coal, which is used in today's electric utility power plants. Coal-based electricity provides 56% of America's electricity. Coal is classified into four categories, or ranks, based on how it responded to increasing heat and pressure over long periods of time and how much carbon it contains. The degree of change undergone by a coal as it matures from peat to anthracite – known as coalification – has an important bearing on its physical and chemical properties and is referred to as the ‘rank’ of the coal. Low rank coals, such as lignite and subbituminous coals are typically softer, friable materials with a dull, earthy appearance. They are characterised by high moisture levels and low carbon content, and therefore a low energy content. Higher rank coals are generally harder and stronger and often have a black, vitreous lustre. They contain more carbon, have lower moisture content, and produce more energy. Anthracite is at the top of the rank scale and has a correspondingly higher carbon and energy content and a lower level of moisture. Lignite (soft): This type of coal contains a lot of moisture and ash and breaks apart easily. Of the four types, lignite has the lowest carbon content and heating value. Also called brown coal, lignite is used mainly at electricity-generating plants. 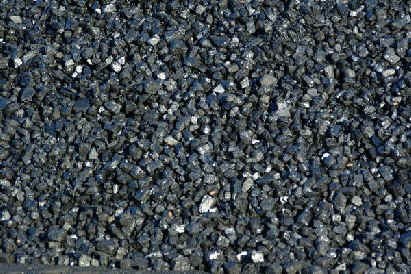 Subbituminous (medium-soft): This dull black coal has less moisture than lignite. Subbituminous is generally used to produce steam for electricity generation. Reserves of subbituminous coal are found mostly in western states and Alaska. Bituminous (medium-hard): This type of coal, which contains very little moisture, has high heat value. It is used to generate electricity and to produce coke, a coal residue used in the steel industry. Bituminous coal is the most plentiful type in the United States. 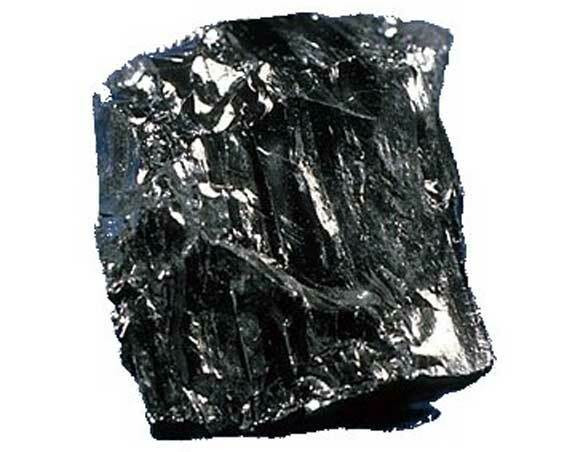 Anthracite (hard): This type of coal has the highest carbon content and the lowest moisture and ash content. Anthracite burns slowly and makes a good heating fuel for homes. The United States has about 7.3 billion tons of anthracite, most of which can be found in Pennsylvania. How is Coal Converted to Electricity? Steam coal, also known as thermal coal, is used in power stations to generate electricity. Coal is first milled to a fine powder, which increases the surface area and allows it to burn more quickly. In these pulverised coal combustion (PCC) systems, the powdered coal is blown into the combustion chamber of a boiler where it is burnt at high temperature (see diagram below). The hot gases and heat energy produced converts water – in tubes lining the boiler – into steam. The high pressure steam is passed into a turbine containing thousands of propeller-like blades. The steam pushes these blades causing the turbine shaft to rotate at high speed. A generator is mounted at one end of the turbine shaft and consists of carefully wound wire coils. Electricity is generated when these are rapidly rotated in a strong magnetic field. After passing through the turbine, the steam is condensed and returned to the boiler to be heated once again. The electricity generated is transformed into the higher voltages (up to 400,000 volts) used for economic, efficient transmission via power line grids. When it nears the point of consumption, such as our homes, the electricity is transformed down to the safer 100-250 voltage systems used in the domestic market. Coal is the most plentiful fuel in the fossil family and it has the longest and, perhaps, the most varied history. Coal has been used for heating since the cave man. Archeologists have also found evidence that the Romans in England used it in the second and third centuries (100-200 AD). In the 1700s, the English found that coal could produce a fuel that burned cleaner and hotter than wood charcoal. However, it was the overwhelming need for energy to run the new technologies invented during the Industrial Revolution that provided the real opportunity for coal to fill Its first role as a dominant worldwide supplier of energy. In North American, the Hopi Indians during the 1300s in what is now the U.S. Southwest used coal for cooking, heating and to bake the pottery they made from clay. Coal was later rediscovered in the United States by explorers in 1673. However, commercial coal mines did not start operation until the 1740s in Virginia. The Industrial Revolution played a major role in expanding the use of coal. A man named James Watt invented the steam engine which made it possible for machines to do work previously done by humans and animals. Mr. Watt used coal to make the steam to run his engine. During the first half of the 1800s, the Industrial Revolution spread to the United States. Steamships and steam-powered railroads were becoming the chief forms of transportation, and they used coal to fuel their boilers. In the second half of the 1800s, more uses for coal were found. During the Civil War, weapons factories were beginning to use coal. By 1875, coke (which is made from coal) replaced charcoal as the primary fuel for iron blast furnaces to make steel. The burning of coal to generate electricity is a relative newcomer in the long history of this fossil fuel. It was in the 1880s when coal was first used to generate electricity for homes and factories. Long after homes were being lighted by electricity produced by coal, many of them continued to have furnaces for heating and some had stoves for cooking that were fueled by coal. Coal is our most abundant fossil fuel. The United States has more coal than the rest of the world has oil. There is still enough coal underground in this country to provide energy for the next 200 to 300 years. Coal miners use giant machines to remove coal from the ground. They use two methods: surface or underground mining. 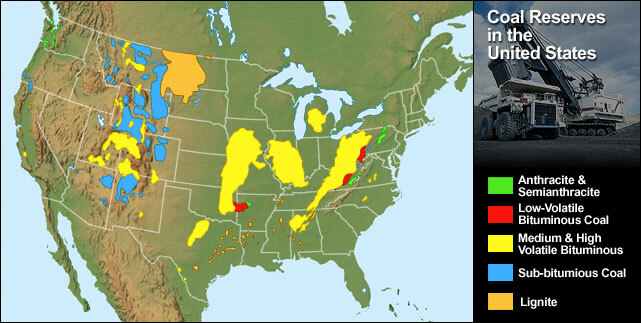 Many U.S. coal beds are very near the ground's surface, and about two-thirds of coal production comes from surface mines. Modern mining methods allow us to easily reach most of our coal reserves. Due to growth in surface mining and improved mining technology, the amount of coal produced by one miner in one hour has more than tripled since 1978. The choice of mining method is largely determined by the geology of the coal deposit. Underground mining currently accounts for a bigger share of world coal production than opencast; although in several important coal producing countries surface mining is more common. For example, surface mining accounts for around 80% of production in Australia; while in the USA it is used for about 67% of production. Surface mining is used to produce most of the coal in the U.S. because it is less expensive than underground mining. 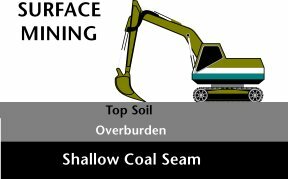 Surface mining can be used when the coal is buried less than 200 feet underground. In surface mining, giant machines remove the top-soil and layers of rock to expose large beds of coal. Once the mining is finished, the dirt and rock are returned to the pit, the topsoil is replaced, and the area is replanted. Underground mining, sometimes called deep mining, is used when the coal is buried several hundred feet below the surface. Some underground mines are 1,000 feet deep. To remove coal in these underground mines, miners ride elevators down deep mine shafts where they run machines that dig out the coal. After coal comes out of the ground, it typically goes on a conveyor belt to a preparation plant that is located at the mining site. The plant cleans and processes coal to remove other rocks and dirt, ash, sulfur, and unwanted materials, increasing the heating value of the coal. After coal is mined and processed, it is ready to be shipped to market. The cost of shipping coal can cost more than the cost of mining it. About 71% of coal in the United States is transported, for at least part of its trip to market, by train. Coal can also be transported by barge, ship, truck, and even pipeline. It is often cheaper to transport coal on river barges, but barges cannot take coal everywhere that it needs to go. If the coal will be used near the coal mine, it can be moved by trucks and conveyors. Coal can also be crushed, mixed with water, and sent through a "slurry" pipeline. Sometimes, coal-fired electric power plants are built near coal mines to lower transportation costs. More than 80% of the world's total proved coal reserves are located in just 10 countries. The US tops the list with more than a quarter of the proven coal reserves, while China, which ranks third, is the biggest producer and consumer of coal.